My husband begged for this mower for quite awhile before I finally broke down and agreed that he could buy it. While it was definitely pricey at $4,500, I can truly say that my lawn has never looked better, and with so little effort. We have 4 acres of land, all grass, and mowing was such a chore before. There are quite a few trees and mowing around them has always been a hassle. Now, my husband loves mowing. He hops on his John Deere and it seems more like he's having fun than doing a chore. The trees are definitely no longer an issue. When John Deere says zero turning radius, they mean it. This thing gets around those trees like nothing. The occasional stick or rock in the yard is not a problem for this monster, either. It gets chopped up and/or thrown out with no damage to the blades or motor. It also seems to move pretty quickly at about 9 MPH. While that doesn't seem fast, cutting 4 acres of grass at 9MPH is a lot faster than you think. My husband can knock it out in a few hours... with our old mower it was an all day job. Our grass grows quickly... we were losing an entire day every other weekend, and now, we lose a morning. It's fantastic. This monster has cup holders and a little storage area. My husband can take a couple of drinks out with him, and a snack or two, and he's pretty much set. Honestly, I think that's his favorite feature. The seat is really adjustable so you can always reach the controls and be comfortable doing it. With the other mowers we've had, my husband was the only one who could use it because I'm pretty short. I can actually use this one, so I like that about it. The seat is also comfortable, which is a plus, because a few hours is a long time to be sitting. This is a great mower. I definitely recommend it, especially for larger properties with obstacles. Though pricey, it's worth every penny. Mowed for 20 minutes on its maiden voyage and then the engine blew up, the piston broke and blew two large holes in the engine. Needless to say John Deere was out there with a loaner within the hour and the warrenty is giving me a new engine. Before that, mowing was a breeze, faster than my old John Deere LX277 all wheel steer that I had for 12 years. Trees and everything where easy to get around. Lets hope the new engine lasts. I do 3 1/2 acres in just under 2 hours. I planted two rows of pines. Ten feet apart ten feet between rows. 120 trees. I can mow around n between them in twenty Minutes. we are thinking of buying a john deere eztrak z445 to mow 1 acre of land with a grade of 22% will 27-hp be enough power? there pricy and i don't want to make a mistake. When my husband and I decided it was time for a new mower, we did plenty of shopping around. With over 4 acres of grass to cut at a time, we knew we wanted a durable model with a wide carriage. 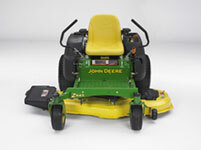 We finally decided on a zero turn mower, the John Deere Eztrak Z445 with a 54 inch deck. We have not been a bit disappointed! With its wide carriage and speed, this mower gets the job done in half the time. What usually took around 5 hours to complete with our old mower now can be accomplished in about two and a half hours. Our new mower is extremely easy to drive and the fact that it can turn on a dime is wonderful! The only drawbacks we have found do not outweigh the positives by a long shot, but they are there nonetheless. One of my favorite features is also a bit of a hindrance; the size. Though it is easy to maneuver, this model is not made for cutting around shrubbery and landscaping. Because of the wide deck, it is impossible to get into tight shapes. Also, the mower is best suited for flat surfaces. We have found that we get an uneven cut on steep inclines. We have been very pleased with this purchase. Even with the cons of this product, the pros are by far more important to the overall purpose of the mower. Darrell, Who do you think you are kidding 2 acres per hour, get real. Using a helicopter are we? For the last ten years I have been mowing 5 1/2 acres with a 1949 Ford 8N tractor. No more, last week I purchased my new 445 mower. Cutting time has went from 4 1/2 to 2 1/2 hours. No more weed eating either. I used my new mower yesterday and I was surprised at how easy it was to learn the zero turn steering. When I finished the job I wasn't even tired. The mower has a comfortable ride and a nice cut. At first my wife wasn't sure how spending so much for a new mower. But after she seen the job it did and how fast I was able to get it done she was glad that we spent the money. I highly recommend that if you are looking for a mower, go test drive a John Deere EZtrak 445. You won't regret it. Bought this mower brand new, had it delivered to home by dealer to the amazement of my 21 year old son, worst purchase I've made in lawn equipment. After 2 months since delivered it has leaked the entire tank of gas on the floor of my garage, (kids were upstairs asleep and the dog woke them up because of odor), stops running almost every time you use it. Arm rests have plastic adjustment brackets (cheaper model at Lowes has metal brackets), both are broken, safety switch that is activated by parking brake is broken (plastic holder cracked), hydraulic tank almost worn through across the top due to contact with arm that moves when parking brake is applied. Dealer had mower for 2.5 months and could not find anything wrong as to why it stops running while cutting the lawn. That's funny, it happens to me almost every time I use it. Once while mowing, very close to A/C units it took one of its spells causing the mower to ram the A/C unit. I sold a Craftsman rider I bought for $1200's 12 years ago and replaced it with this $4800.00 piece of junk. I could have bought 4 Craftsman riders and had 3 spares for the same price. I love my Z445. It replaced a tractor with a 6ft slasher and an 11hp walk behind mower, easily doing both jobs. It goes around plants with ease, is powerful and is fast. My only issue has been with dry bushes in the self starter. It was easily removed and fixed at no cost, although the problem was disappointing after only 100hrs. The Kawasaki engine is brilliant and the cut quality without fault. I find the blades need sharpening every 15 or so hours, but my environment is pretty rugged, with lots of dust and stones. Mower purchased Nov 07, Australia. I just purchased my Z445 and it think I will love it. I have been cutting grass for the last ten years with a 1949 8N Ford Tractor with a 5 ft Woods. But now this is a machine that my wife will be able to learn to use. So we are very excited about our purchase. I will post back and let everyone know how it's doing.